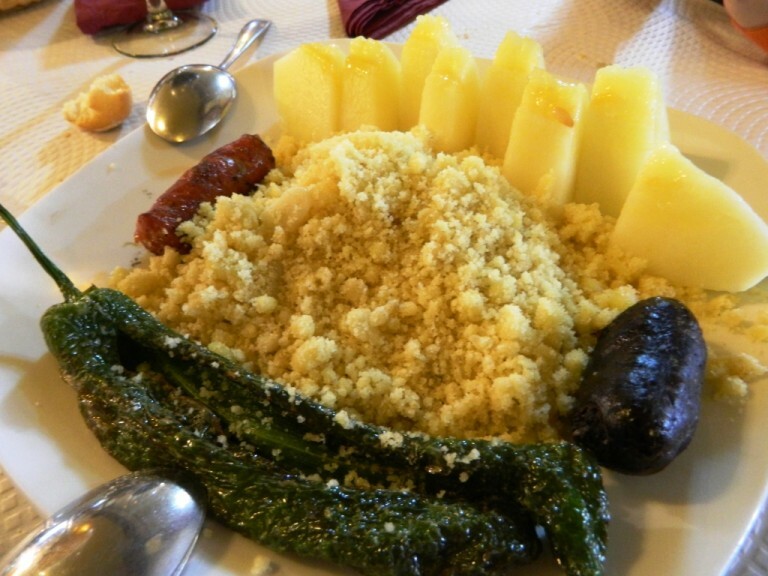 A Traditional Spanish Dish but What are Migas? Olive oil and breadcrumbs. That's the mainstay of migas, with garlic of course. A dish of the poor. A dish concocted in those times of hunger and poverty when nothing was wasted, not even the hard, old bread. It's a dish that takes time and effort to prepare and is often served with melon or watermelon – whatever fruit was available in their veggie garden. Sometimes it was the juice from the fruit itself that was used to moisten the breadcrumbs instead of water before frying. Where the dish originated from seems unclear but the favourite story of its introduction seems to be this one. When a family's bread left hanging outside became wet and falling apart, they gathered it together, being all they had, and only having olive oil in the house began to fry the sodden bread in the olive oil. Everyone in this area had olive oil either because they had olive trees or because they'd been out gleaning in the olive groves after the harvest. Being cold and hungry and without any other sustenance they kept on stirring and frying until the bread began to dry and solidify and become something that was edible. This first dish of 'crumbs' became a popular dish and still is. 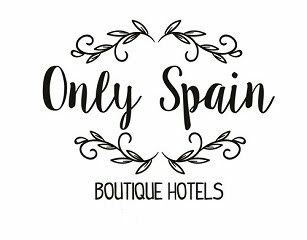 It's also now found throughout the Iberian peninsula. These days migas has gone very much upmarket and can be found served with belly pork, chorizo, tomato or peppers added and is often on upmarket restaurant menus. 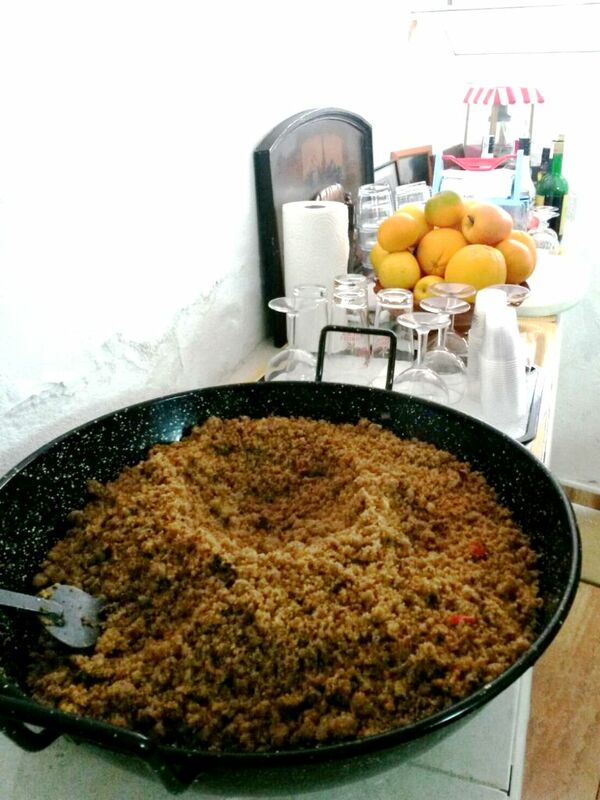 It's often referred to as Migas de Pastor or Shepherd's Breadcrumbs and make a surprisingly hefty and filling dish. Although it's not one I'd ever choose, having more than once been given reheated migas made from leftover bread as tapas, it really isn't my thing. So how does one make migas? My friend and neighbour, Loli, insisted on teaching me how to make them after questioning her on whether she made them, if she liked them and what she served them with. First we needed several days to accumulate the sufficient quantity of old bread. 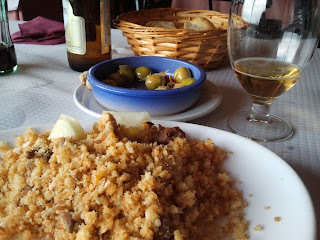 I faired very badly in this task as unlike the Spanish we don't eat bread with every meal. And when we do it's brown bread usually with seeds. My collection wasn't approved by my teacher. Loli, as they do easily, had an enormous bag filled with hard white bread, enough for us both (and our families) to have migas for lunch she said. I tried to look pleased with the thought. Her brown and brawny arms heaved a great big mixing bowl, one usually used during the pig killings to collect the blood I was informed, onto the table. I hoped I didn't pale or I never live it down. The old bread was dumped in, some bouncing out it was so hard. What seemed to be an enormous amount of water was added then off we went to see her menagerie while the bread became moist. Lots of dogs, cats and chickens wandered around the yard but what she really wanted me to see were three gigantic and scary turkeys. Almost as tall as her, and certainly as round. She'd been fattening them up, (as well as herself, hubby and kids, I thought) and was was very proud that they'd be killing them all in the next few weeks. They were only four in the family. Unfortunately for me the pigs had been kept elsewhere but had just been moved back ready for the final feeding up - I had to admire them too. Two huge, great, pink and muddy brown beasts and both were for the chop. There are only four of them in the family. Back to the calmness of the kitchen and happy with the moistness of the bread a frying pan large enough to sit in was produced and almost an entire 5l bottle of olive oil emptied in. When the oil was hot enormous handfulls at a time were added until the pan, rather like a cauldron of popcorn, seemed to ooze soggy bread. Loli stirred and turned and worked that mass over and over. And then over again. Time ticked by, she let me stir and turn and work the now drying bread but my efforts weren't enough. It was hard work, but she wanted control and kept on stirring as the bread was not looking more like breadcrumbs and turning a nice golden brown colour. Soon she was satisfied and turned off the gas. Reaching for plates she exclaimed it was time to taste it. I explained that it had taken longer than I thought and was it alright with her if I took it home to eat with the family. Fortunately she agreed. I arrived home for lunch and with lunch but hubby and three sons weren't amused. I've included lots of Spanish dishes into our daily dining but for us this is one that won't be on our table just as posh restaurant or not I'll never order it out. It's a bit like Marmite - Love it or Hate it! Which side are you on?